Like overconsumption of calories, overconsumption of protein widens the food gap. Furthermore, animal-based foods are typically more resource-intensive and environmentally impactful to produce than plant-based foods. Production of animal-based foods accounted for more than three-quarters of global agricultural land use and around two-thirds of agriculture’s production-related greenhouse gas emissions in 2009, while only contributing 37 percent of total protein consumed by people in that year. 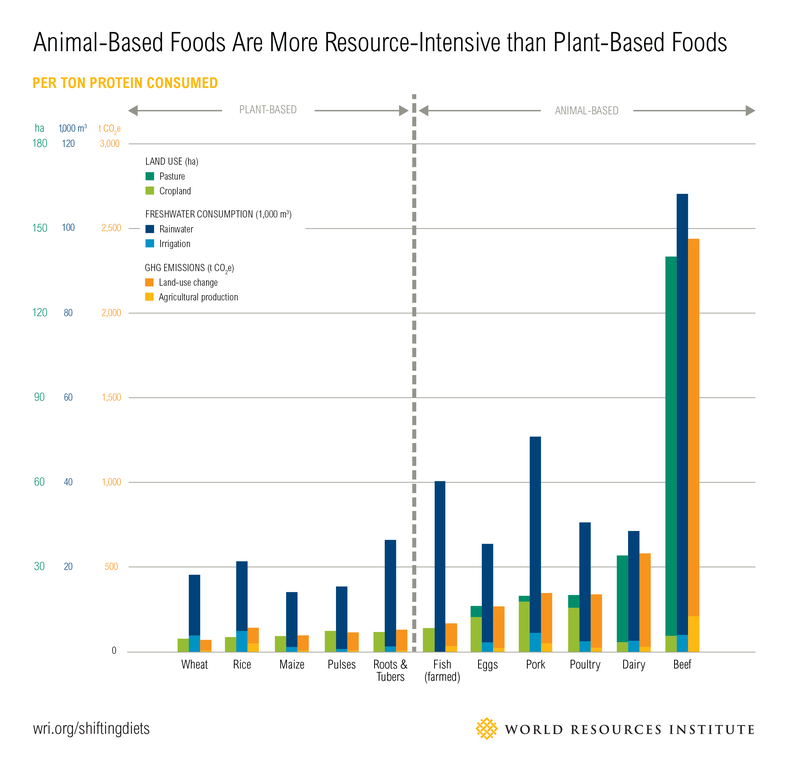 Because many animal-based foods rely on crops for feed, increased demand for animal-based foods widens the food gap relative to increased demand for plant-based foods. Notes: Data presented are global means. Entries are ordered left to right by amount of total land use. Indicators for animal-based foods include resource use to produce feed, including pasture. Tons of harvested products were converted to quantities of calories and protein using the global average edible calorie and protein contents of food types as reported in FAO (2015). “Fish” includes all aquatic animal products. Freshwater use for farmed fish products is shown as rainwater and irrigation combined. Land use and greenhouse gas emissions estimates are based on a marginal analysis (i.e., additional agricultural land use and emissions per additional million calories or ton of protein consumed). Based on the approach taken by the European Union for estimating emissions from land-use change for biofuels, land-use change impacts are amortized over a period of 20 years and then shown as annual impacts. Land use and greenhouse gas emissions estimates for beef production are based on dedicated beef production, not beef that is a coproduct of dairy. Dairy figures are lower in GlobAgri than some other models because GlobAgri assumes that beef produced by dairy systems displaces beef produced by dedicated beef-production systems.